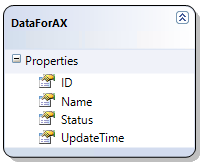 You sometimes need to connect from Dynamics AX to another database and read or write data there. The usual approach uses OdbcConnection class, as described on MSDN in How to: Connect to an External Database from X++ Code [AX 2012]. Although it definitely is a possible solution (I used it already in AX 3.0), it has so many problems that I almost never use it these days. My intention is to show one of possible alternatives that solves many of these issues. 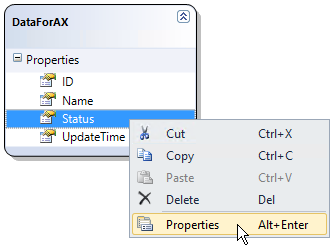 Although the core idea can be used in AX from version 4.0, this blog post uses AX 2012 and depends on several features that don’t exist in older version. You have to define the query as a simple string, therefore you have to write SQL code by yourself, you won’t get any IntelliSense, compile-type control or anything like that. You have to execute your SQL against the target database to find errors such as misspelled field names. You also depend on column indexes when accessing data, which becomes cumbersome very quickly and it’s easy to break. For example, notice that the query above selects all fields. What will happen if I add another field, e.g. the query starts returning ANewField, Field1 and Field2 instead of Field1 and Field2? 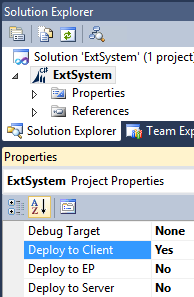 Column indexes now refers to different fields and it again won’t be found until actually running the code. It’s simply unpleasant for development and horrible for maintenance. Wouldn’t it be better if we could simply refer to field as if we do in normal X++ development, get compile-type control and so on? Good news – we can! Before we actually start, let me show you the table that will simulate my external data. It has four fields: ID and Name that I’m going to import to AX, Status used for tracking what needs to be processed and UpdateTime storing the data and time of the update. Note that it’s important for the table to have a primary key, otherwise we wouldn’t be able to update the data. Let’s also prepare some objects in AX. We’ll need a table storing the data and because the Status field is an integer representing various states, we can very naturally model it as an X++ enum. Now start Visual Studio, because most of our work will happen there. Create a new C# class library, add it to AOT and drag the table and the enum from Application Explorer to your project. We’ll need them later. Open Server Explorer (View > Server Explorer) and create a connection to your database. 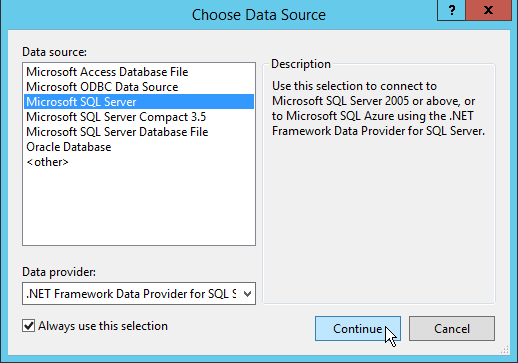 I’m using a SQL Server database on the current machine, but you can use ODBC, connect to remote servers or anything you need. 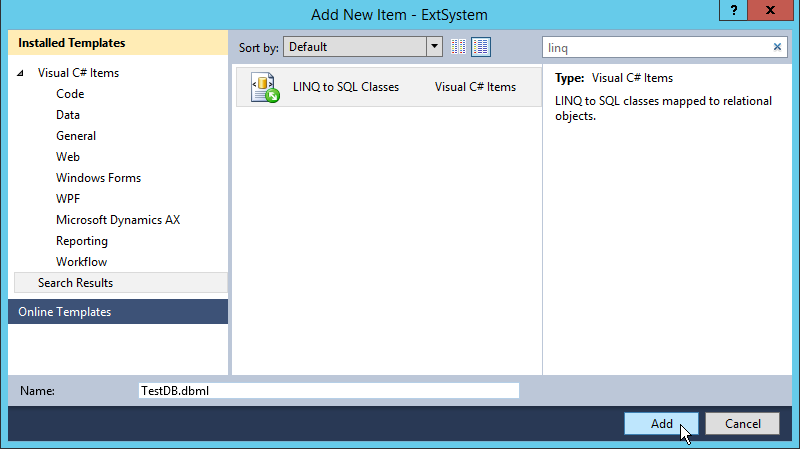 Right-click your project in Solution Explorer, choose Add > New Item… and find LINQ to SQL Classes. 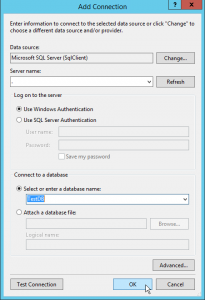 Set the name (TestDB) and click Add. A database diagram will be added to your project and its design surface will open. Drag the table from Server Explorer to the design surface. It’s a more advanced topic, but notice that it’s a partial class. It allows you to extend the class without meddling with code generated by the designer. Extending the class is useful in many scenarios, but we don’t need it today. There is one thing we should change, though – the type of the Status field is byte while would like to use our enum from AX. Go to the designer, open properties of the Status field and type the name of the enum (ExtRecordStatus) into the Type field. It might look as nothing special, but I think it’s pretty cool. We’re mapping a field from an external database to an X++ enum (albeit through a proxy) and we’ll be able to use in LINQ queries, when assigning values to the field and so on. It’s a class that defines where to connect, track changes and so on. 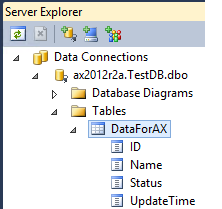 In real implementations, I usually store DB server and DB name in AX database, create a connection string from them (with the help of a connection string builder) and pass the connection string to data context’s constructor. Then we create the LINQ query. This simple example can’t show the full power of LINQ, but it’s obvious that we’re not building SQL by ourselves; we use strongly-typed objects instead. Notice also how we filter the data by the X++ enum. The foreach loop fetches data from database and fill it to an instance of DataForAX class. Later we simply access fields by name – nothing like resultSet.getString(3) anymore. sets data to an AX table buffer (ExtTable is the table we created in AX at the very beginning) and calls its validateWrite() and insert() methods as usual. I typically pass records back into AX and process them there, but inserting them to AX database from here works equally well. Then the code changes values of Status and UpdateTime fields. Finally db.SubmitChanges() writes changed data to the external database. We could also insert or delete records in the external database if needed. That completes our library; the remaining step is calling it from AX. Open project properties and choose where to deploy the library. We’ll run it from a job for demonstration, therefore we have to deploy it to the client. Rebuild the project and restart your AX client, if it was running. That’s all what we need to do here, because reading the data, inserting them to AX database and updating the external database is already handled by the .NET library. The whole application has just a few lines of code, doesn’t contain any strings with SQL commands, it doesn’t depend on the order of columns, the compiler checks whether we use data types correctly and so on. It may require to learn a few new things, but I strongly believe that AX developers should look more at how things are done these days instead of sticking to old ways and low-level APIs such as the OdbcConnection class. Many great frameworks and language features waits for you to use them to increase your productivity and develop things hardly achievable in X++ – and AX 2012 made it easier than ever. It’s would be a pity not to benefit from all the progress done in recent years. I couldn’t really discuss LINQ or the database designer while keeping a sensible length of this post. Fortunately you’ll find a plenty of resources about these things. LINQ to SQL also isn’t the only way – maybe ADO.NET would be more suitable for your particular project. Nevertheless I hope I managed to show you how to use these frameworks from AX – and that it’s not difficult at all. Knowing I can map a field from an external DB to an AX Enum proxy is awesome! Very useful. I will follow this method. Nice with the ORM. Just tried and it works brilliantly. 1. Where does the DLL get deployed to? 1. 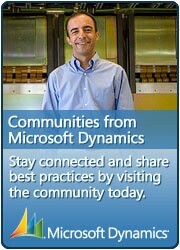 It goes to %USERPROFILE%\AppData\Local\Microsoft\Dynamics AX\VSAssemblies. I’ll consider writing a follow-up post and show the code dealing with connection strings. You wrote “I typically pass records back into AX and process them there”. Could you elaborate on this and possibly give an example? It means that I normally don’t put domain logic into the .NET class library, such as initalizing fields according to parameters in AX, running validations etc. Instead, I do all these things in X++ (so you can see it in AOT, get cross-references etc.) and merely call a method with this logic from the class library. Thanks much for your reply Martin. So you’re calling a method in AX from your class library, with parameters for each of the relevant fields in the record you queried with LINQ? No, there are no parameters for fields. I fill fields on table’s proxy and pass it back to AX (= a single parameter). Continuing the example from the post, I would fill fields of axTable in exactly the same way, but then I would pass axTable back to AX. There I would do any further processing and call validateWrite() etc. Once again thanks for your reply Martin. That worked perfectly, and was much easier than I was imagining. Can we do the same in AX7??? 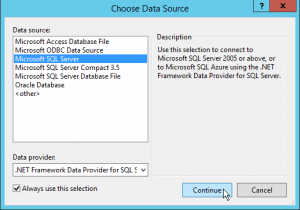 Dear sir I want to Access View in Externel database from D365FO can you please help me out? I would need more information from you. I strongly recommend you explain your requirements in detail in a discussion forum, such as https://community.dynamics.com/ax/f/33. I tried to implement this in AX 7 (D365FO). The first thing I was unable to do is to add an AX table in the C# class library project. I cannot move further if I can’t add the table to project as I won’t be able to access its fields and methods. Can you show how to make changes to ExtTable(editing, inserting, deleting). I mean if we can make changes from the table in ax(ExtableTest) to the outer(DataForAXes) ? For example, can we insert from axTable to DataForAXes. Yes, that’s what I meant. The blog post uses LINQ to SQL to read the data and you can use it for writing as well. That’s why I gave you a link where you can read how to do it. 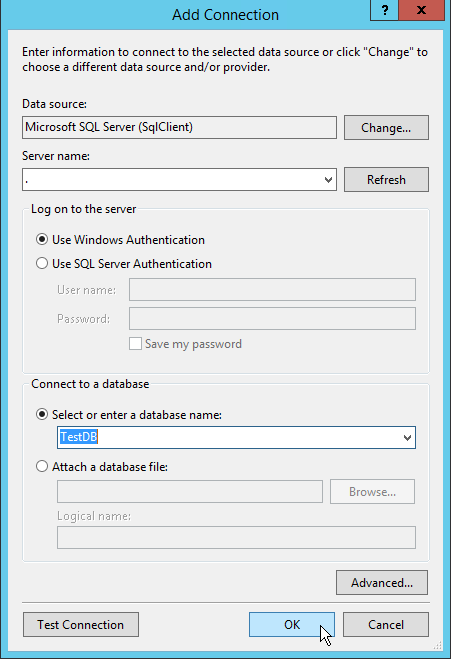 You don’t have to use LINQ to SQL, of course, but than it wouldn’t be related to this blog post. You can create a thread in a discussion forum (e.g. https://community.dynamics.com/ax/f/33 or https://dynamicsuser.net/ax/f) to discuss other approaches and to reach more people.